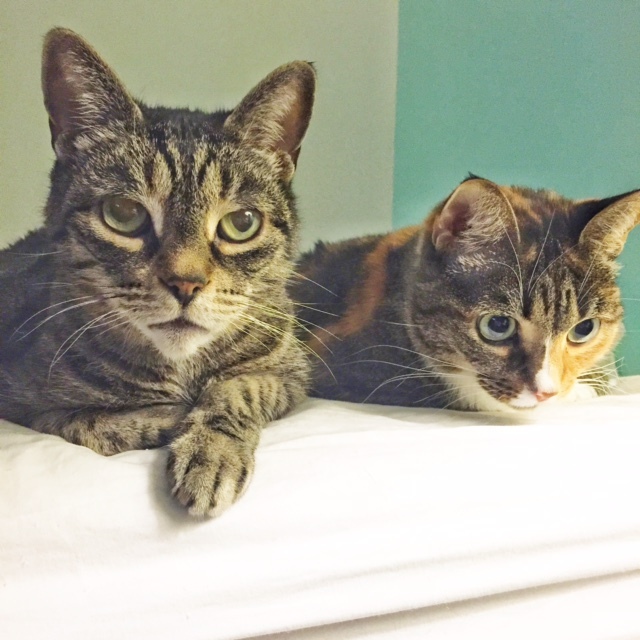 Healthy Swellness: The cats are taking the Nutram Optimum Transition Challenge! My two cats, Kobe and Mya, are finally earning their keep around here! Kobe’s been freeloading for 14 years and Mya nearly 8 years. So it’s high time they pitched in a little. Cuteness and cuddles doesn’t pay the bills! So when Nutram asked if they’d be up for the Nutram 30-Day Optimum Transition Challenge, I said hellz yeah. The challenge involves transitioning these two furry troublemakers onto a holistic diet that’s been tailored to suit their needs. (You’re welcome to have your cat or dog join the challenge, too; get more info on the Nutram site about the challenge, and you’ll also be able to find out which food is recommended for your pet). Nutram, a Canadian company, makes 21 premium dry cat and dog foods; there’s a wide range of choices because cats and dogs need different diets depending on their size, life stage, activity level and specific animal needs. So over the course of the next four weeks, I’ll be slowly transitioning them both onto the holistic Nutram diet…although now that I think about it, are these cats really contribution to the household? They’re getting to eat local, tasty and nutritious food, enjoy treats like the luxe cat caves they received from Nutram, while I have to still feed them, scoop their litter box, monitor their progress and write these posts?! How’d they pull a fast one on me yet again?! All jokes aside, I’m keen to see how this little wellness challenge affects them. Their health and wellbeing means a lot to me; I think about it often, probably because Kobe just turned 15 years old this month, and, well, I want him and his feisty little sister to live long and healthy lives. I’ll be posting both here on the blog and on Instagram and Twitter about their progress (follow along on social media with the hashtag #nutramOTC). Not familiar with Kobe and Mya? Check out their Tinder-esque profiles on the Nutram site.